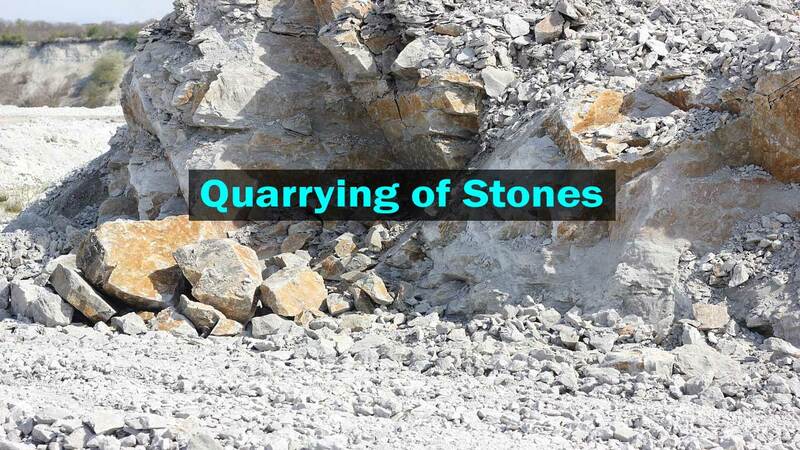 Here in this article, you are going to learn everything about and related to Quarrying of Stones in details. Selection of Site for Quarrying of Stones. Preparation Steps for Stone Quarrying. Methods of Quarrying of Stones. Quarrying of Stones Without Blasting. Quarrying of Stones by Blasting. Stones occur in the form of natural rock masses or layers on the surface. The process of extraction of suitable stones from their natural rock beds or layers is commonly called Quarrying of Stones. 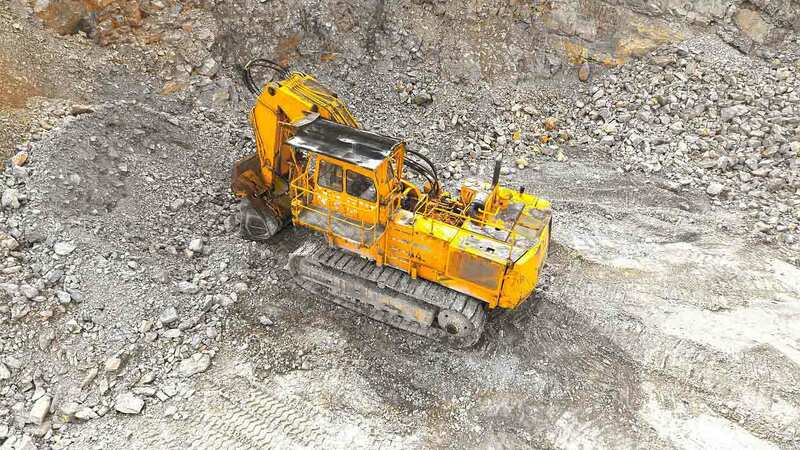 It differs from the mining of ores of metals in that whereas quarrying is an operation carried out entirely on the surface, mining involves digging below the ground, sometimes at considerable depth. A quarry is a place where different types of stones are extracted. Engineers and contractors have to keep following factors into consideration while deciding about the location of a quarry site. (i) Availability of sound rock: A quarry can be opened up only where a sound rock that can yield good quality building stones exists in the considerable area. Once opened the quarry should be able to supply the stones for quite a few years. The stone must be available in large quantity and must be of uniform quality. (ii) Distance from the areas of construction: Quarrying is commonly a commercial operation. The quarry must not be located far away from the area where constructional activities are going on. In such a case when it is located far away, the cost of transport of stone from the quarry to constructional sites may become too heavy. At the same time, a quarry must not be located very close to a town because quarrying operations are full of hazards. This becomes especially important when blasting method has to be used for quarrying of stones. (iii) Distance from main roads: Stones extracted from a quarry have to be transported to the nearby towns and cities. Naturally, the quarry must be located near to the main network of roads leading to those towns and cities. Otherwise, longer approach roads will have to be constructed that will add to the cost of haulage of the Stone. (iv) Availability of water and dumping space: In quarrying operations, considerable man power is employed. Water is an important necessity for the work force. 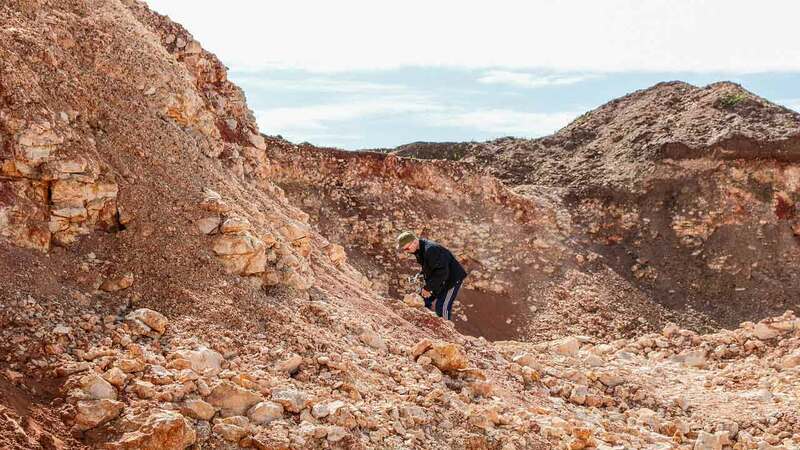 It must be available in sufficient quantity near the quarry site. Similarly, quarrying operations involve a lot of breaking of different types of rocks all of which are not useful for building construction. Such waste rock or refuse has to be dumped on one or other side of the quarry, so that main quarry face is not blocked. The required dumping space should be easily available near the quarry. (v) Another factor is drainage system: Ground water and surface water have to be quickly drained. It should be possible to provide adequate drainage at the quarry site. (i) Selection of Method for quarrying: At present, quarrying can be done either by manual methods or by machines. The method has to be chosen right in the beginning. The choice will depend upon the size of the quarry, the nature of the rock and the demand for building stones. (ii) Preparation of a layout: In accordance with the method selected for quarrying of stones, a scheme or layout for quarrying will be prepared. 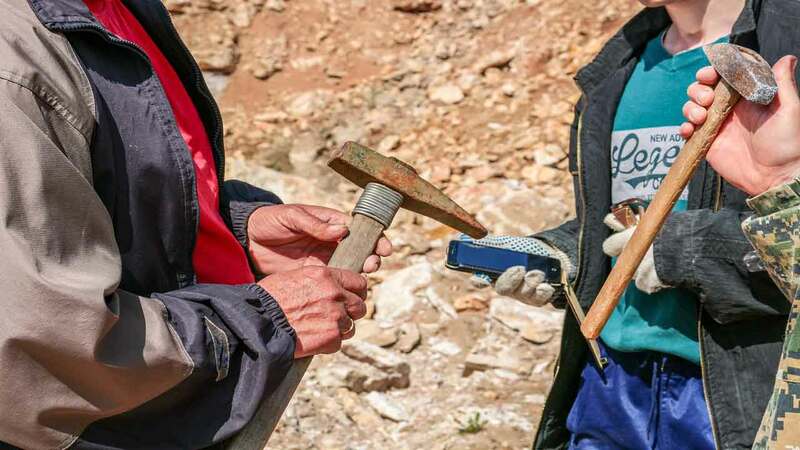 This will determine from which side the natural rock bed will be extracted first ( the attack face) and how the extraction will progress in the subsequent phases. (iii) Removal of the over burden: The surface of natural rock beds are invariably covered by some thickness of soil or lose material. Irrespective of the methods of quarrying of stones, this over-burden has to be cleared first before the actual quarrying operation could be started. Similarly, some loosely held rocks on the slopes have to be removed to avoid accidents in the later operations. Quarrying methods are classified differently. It is convenient to divide them under two main headings, namely, quarrying without blasting and quarrying by blasting. In these methods, blocks of rocks are broken loose from their natural outcrops by men using hand tools or special purpose channeling machines. No explosive material is used at any stage in this method of quarrying of stones. Soft rocks and also those rocks which have layered structure are easily quarried by these methods. As a first step, the loose cover of soil over the rock (the over-burden) is first removed and the rock surface is cleared. It is then systematically broken into blocks of desired sizes either by driving wedges or by cutting channels. It is consists of digging a few holes at carefully selected places on the rock. These holes are dug either manually using chisels and hammers by the skilled workers. Or, in major quarrying, these holes may be drilled by special machines called hammer drills. Once the hole is ready, a steel wedge is inserted in between two steel strips or feathers. This is done with all the holes drilled in a sequence. Such firmly inserted wedges are then struck with a hammer almost simultaneously. This process develops cracks along the lines joining the holes. After that, long iron bars are inserted in the holes and cracks, and then the blocks of the rocks are pushed forward onto the free face of a quarry. In this method of quarrying, involves the use of big machines called Channelizers which have reciprocating cutting tools and are power driven. When single large blocks of costly stones like marbles and limestones are required, this method is most suitable. The channelizer can cut a groove as deep as 3 meters, as wide as 5 cm and as long as 3 meters, or even more. When a single block is required, grooves of required depth and length are first cut at the back and sides of the working face of the quarry. Holes are then drilled from the free front side horizontally to meet the back channel at its base. Using wedges and rods, the block is separated from the rock and hoisted up to the transporting lorries or wagons. Single blocks as big as 10 meters long and 3 meters thick and 1-3 meters wide can be quarried by this method from soft rocks. It is an old, crude method which may be useful locally for obtaining small quantities of stones. Rocks are heated for a few hours by burning heaps of firewood over their surface. Such a process results in expansion of the upper layers and their cracking and separating from the lower layers. This method consists of using explosives for breaking stones from very hard rocks. It has been observed that quarrying of granites, basalts, traps, quartzites, and sandstones by wedging and other methods is very laborious and costly. These hard rocks, however, can be loosened economically and easily by using explosives. The basic principle of this method is to explode a small quantity of an explosive material at a calculated depth within the rocks. The force generated due to this explosion is sufficient only to create cracks and loosen blocks of good size. Blasting for quarrying for stones may be quite different from blasting for road clearance. In the latter case, the size of the broken stone is of not much consequence. Quarrying by blasting, therefore, requires very experienced persons thoroughly acquainted with blasting explosives on the one hand and strength qualities of rocks on the other hand. Quarrying by blasting involves a series of systematic operations such as drilling of blast-holes, charging of blast-holes and firing the shots. A blast-hole is a hole of suitable diameter and depth driven at a properly selected location on a rock for being charged with an explosive. It may be driven either manually or mechanically. In mechanical drilling, machines such as hammer drills, percussive drills or rotary drills are used depending on the nature of the rock. In the quarrying by blasting, the diameter, depth, number, and spacing of boreholes require very careful considerations for getting the most beneficial result. The diameter of the hole is determined with the type of explosive being used. For explosives that come in standard sized cartridges, the diameter has to be slightly greater than the size of the cartridges for allowing easy insertion. Bu when blasting powder has to be used, the diameter of blast-holes will depend on the quantity of explosive to be accommodated as also the convenience of drilling the holes. The depth of blast-hole depends on the volume of rock to be broken in one shot which is also related to the quantity of the explosive that has to be charged into the hole. The Spacing of holes has to be decided carefully when a number of holes are to be charged and fired simultaneously. A given quantity of any explosive can induce cracks, break open or throw away limited volumes of rock around it on exploding. Naturally, when holes are too closely spaced, they will shatter the rock into smaller, useless pieces. When they are spaced too far off from each other, cracking caused on their explosion will not break the entire aimed rock mass in the desired manner. Properly spaced holes charged with calculated quantities of explosive will not only break the calculated volume of rock into blocks of manageable size but also throw them at a proper distance from the quarry. While spacing the holes, the distance from the free side of the quarry is kept into consideration. On exploding, the main thrust is along the shortest distance to the free side. This (distance) is called the line of least resistance. If this line is of considerable length, the shot may prove effective. Similarly, if this distance is too short, the broken stone may be thrown far away from the quarry. The loading or charging of the blast-holes with pre-determined quantities of the selected type of explosive is to be done with great care and caution. A slight negligence in this operation may lead to fatal accidents. (i) The holes are first cleared of all the obstructions and irregularities with the help of wooden romping rods. (ii) Explosive in the form of powder packs or cartridges is then inserted in small quantity at a time. Before adding the next batch of explosive, the previously placed quantity is packed firmly by using wooden tamping rods (metallic rods are never used). (iii) When blasting powder is used as an explosive charge, a fuse is inserted. In the case of charge is in the form of cartridges a primer cartridge (which has a highly sensitive explosive), it is also inserted and is connected to a safety fuse. The hole is generally filled from 1/3 to 1/2 its depth with the explosive. (iv) The hole is then summed. Stemming consists of filling the remaining 2/3 to 1/2 depth of blast-hole (above the last compacted layer of explosive) with inert and non-combustible material like powdered clay, rock and, sand. This is also done in installments. Each installment of the stemming material is thoroughly compacted before placing the second layer. The main object of the stemming process is to prevent the escape of the gases produced by the explosion through the hole. They are made to pass to other directions and do the job of breaking the rock by their energy. (v) It is also customary to put the safety fuse (for firing) at the beginning of stemming operation. In another arrangement, a thin rod is kept inserted in the hole during the stemming process. This rod is removed at the completion of stemming, and the fuse is inserted in its place. (vi) Sometimes stemming is done in layers alternating with explosive layers. This becomes almost necessary in deep holes involving the use of large quantities of an explosive in each shot. It is the final step involving igniting the explosive in the blast-holes by using a safety fuse or by electric detonators. A Safety fuse is essentially a thin strain of gun powder properly wrapped in a cotton thread. When ignited, it burns from one end to the other end at a fixed speed, generally 100-130 seconds per meter. One end of such a fuse length is connected to the blasting cap of the primer cartridge. The other free end of the fuse trails at the surface. It is this free end that is ignited by the firing man who has time at his disposal to run to a place of safety proportional to the length of the fuse. An electrical detonator is a specially designed metallic cap which contains a highly sensitive charge filled in it; Over the charge hangs a thin copper filament which conducts an electric charge. As the current is switched on, the filament in the detonator gives a powerful spark. This ignites the sensitive charge which makes a small explosion that is sufficient to blow the main Explosive in the blast hole. Thank you for all the information about the quarrying of stones. I learned that my grandpa worked in a quarry and I got curious about what that was. That is really cool that quarrying can be done manually or by machines. I had no idea that they could automate everything. A good friend of mine was thinking about going to a drilling and blasting service for an upcoming project. He wants to look into the various components of this work. I will let him know that there is a firing of the shot that must happen. this site is very helpful. i have a large rock surrounded by buildings,though not very near the rock.are there equipments and methods i can employ that can make me remove this large rock? thank you. THIS IS A VERY EDUCATIVE ARTICLE, PLEASE CAN I KNOW THE AUTHOR SO I CAN REFERENCE HIM OR HER IN MY SCHOOL PROJECT? Hey, Thanks for your Nice Words. You can REFERENCE us as CivilSeek.com or James Brian. Thanks a lot, am a building technology student and this has helped me to do my assignment and am greatful.